Bianca Vanessa Andreescu, professionally known as Bianca Andreescu is a Canadian professional tennis player. She turned pro in 2017. She has reached her career-high WTA singles ranking of No 24 as of 18 March 2019. She has also reached a career-high combined junior ranking of No. 3 on 1 February 2016 as ranked by the International Tennis Federation (ITF). She has won the 2017 Australian Open and French Open junior doubles titles with Carson Branstine. She won the 2017 Fed Cup Heart Award and was named the 2017 Tennis Canada female player of the year. She has over 64k followers on her Instagram. 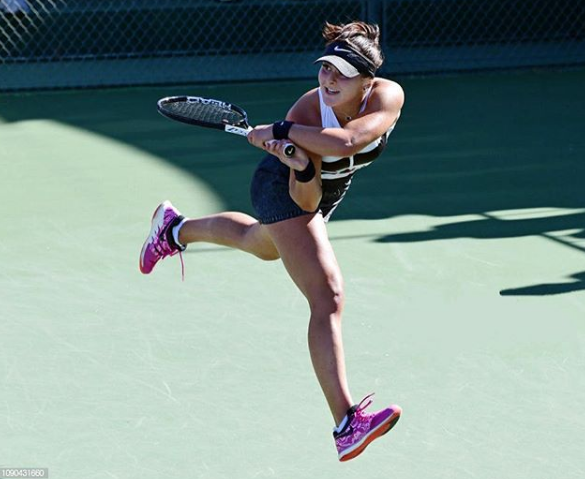 Biana Andreescu, the aspiring tennis player from Canada won her first WTA title, Indian Wells Masters on 18 March 2019 after she defeated Angelique Kerber in three tight sets. During the Tour, she became the third wildcard to reach the semifinals of the tournament defeating Camelia Begu, Dominika Cibulkova, Stefanie Voegele, and Wang Qiang. She defeated 6th seeded Elina Svitolina in three sets in the semifinals to become the first wildcard to reach the finals in Indian Wells history. With the win, she reached her career-high WTA ranking of No. 24. Reached career-high WTA ranking of No. 24 as of March 2019. Bianca Andreescu was born on 16 June 2000. Her birthplace is in Mississauga, Ontario in Canada. She holds Canadian nationality. She was born to Romanian parents, Nicu Andreescu, a father, and Maria Andreescu, a mother. She started playing tennis at the age of 7, while she was in Romania after her family moved back to her parents' native. A few Years later, the family returned to live in Canada. She was raised by her two Romanian grandmothers in Canada. Bianca trained at the Ontario Racquet Club in Mississauga. She joined Tennis Canada's National Training Program in Toronto when she was 11 years old. Simona Halep advised and encouraged her to turn professional very early after she witnessed Bianca play at the 2016 Rogers Cup. She completed her high school diploma online at Bill Crothers Secondary School in Toronto. Bianca won Les Petits As in January 2014. It is one of the prestigious 14-and-under tournaments in the world. She won her first junior titles, taking the singles title at the Grade 5 tournament in Havana and the doubles title with Maria Tanasescu at the Grade 4 tournament in Nassau in July 2014. She won her second and third junior singles titles in the fall at the Grade 5 tournament in Burlington and Grade 5 tournament in Lexington. She ended her 2014 season winning Under 16 title at the Orange Bowl making her the fourth straight Canadian after Erin Routliffe, Gloria Liang, and Charlotte Robillard-Millette to win that event. She won both the singles and doubles titles at the Grade 2 tournament in LA Paz at the beginning of the 2015 season. She was qualified for her first junior Grand Slam at the French Open. She was defeated in the first round in girls' singles by Anna Kalinskaya and in the second round in girls' doubles. She was eliminated in the first round in girls' singles and in the second round in girls' doubles at Wimbledon 2015. She reached to the final of the ITF 25K in Gatineau in her first professional tournament in August 2015, where she was defeated by Alexa Glatch. She won her first Junior Grade 1 title defeating Robillard-Millette in Repentigny in September 2015. She became the first Canadian since Gabriela Dabrowski in 2009 to win the under 18 Orange Bowl, a Grade A tournament. She also became the first to win the under 16 and under 18 titles in consecutive years since Mary Joe Fernandez in 1984-85. Former world number 3 Nathalie Tauziat starting training Bianca in 2015. She was named the 2015 Outstanding Junior Female by Tennis Canada. She was favorited to win both the girls' singles and doubles at the Australian Open 2016. But she withdrew from the competition in the third round because of recurring injuries including her left adductor, right ankle, and a stress fracture in her foot. The injury kept her out for six months. She claimed the first professional title of her career with a straight-sets victory over Elizabeth winning Gatineau 35K tournament in 2016. She also won the Gatineau doubles title with partner, Charlotte Robillard-Millette. She reached the semifinals in singles and the quarterfinals in doubles, her best run so far at a junior Grand Slam, at the US Open 2016 in September. She reached the semifinals and won the doubles with Carson Branstine at the 2017 junior event of the Australian Open. She won her second 25K singles title with a straight sets win over Kayla Day in February 2017. She then won the 25K singles title in April 2017. She captured her second straight Slam doubles titles with Carson Branstine at the junior French Open in 2017. She only reached the quarterfinals in singles. She was qualified for her first senior main draw at Wimbledon in 2017 but was defeated by Kristina Kucova in the opening round. She achieved her first win on the WTA Tour defeating Camila Giorgi in the opening round. She was awarded a wildcard for the main draw at the Citi Open in August 2017. In her next match, she became the first player born in the 2000s to beat a top 20 player when she defeated world No. 13 Kristina Mladenovic. She exited from the quarterfinals after losing to Andrea Petkovic. She reached her first WTA final with her partner, Branstine. They lost the final to Timea Babos and Andrea Hlavackova. She won her second doubles title winning the 60k tournament doubles title with Carol Zhao in October 2017. She lost the 25K tournament final to the first seed Luksika Kumkhum in April 2018. She won Fed Cup doubles with her teammate Gabriela Dabrowski in April 2018 and advanced to World Group II. She reached her first WTA singles final at the ASB Classic in Auckland defeating Caroline Wozniacki, Venus Williams, and Hsieh Su-Wei. She lost to defending champion Julia Gorges. She won her first WTA 125K title at Newport Beach in January 2019 taking her to a career-high ranking of No. 68. She also passed Eugene Bouchard to become Canada's top-ranked player. She reached the semi-final of the Mexican Open in February 2019, where she lost to Sofia Kenin. She reached her new career-high ranking of No. 60. She had a breakout win defeating Angelique Kerber for her first tour victory at the Indian Wells Premier Mandatory event. She became the first wildcard to reach the finals in Indian Wells history. She partnered with Maria Tanasescu and Brindtha Ramasamy to represent Canada at the World Junior Tennis event in 2014. Canada finished 7th overall. She teamed with Robillard-Millette and Vannessa Wong to represent Canada at the 2015 Women's Junior Fed Cup finals in Madrid. Canada finished 3rd overall. She teamed with Isabelle Boulais and Layne Sleeth to represent Canada at the 2016 Junior Fed Cup. Canada finished 5th overall. She represented Canada at the Fed Cup Americas Zone Group I in 2017. She defeated world No. 51 Yaroslava Shvedovva, which was her biggest win to date. Canada went on to win the tie 3-2 securing its place in the World Group II in 2018. She played in the first of the World Group II with Gabriela Dabrowski, Sebov, and Zhao against Romania in 2018. She lost her singles match to world No. 37 Irina-Camelia Begu. Canada lost the tie 1-3. She lost her singles match to world No. 40 Lesia Tsurenko in the World Group II Play-offs. She won the deciding doubles with Dabrowski to help Canada stay in the World Group II in 2019. 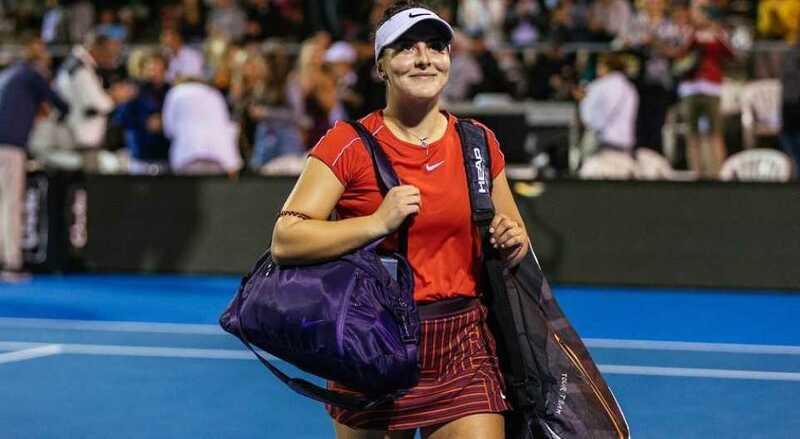 She helped Canada to overcome the Netherlands 4-0 in Fed Cup World Group II in January 2019, where she defeated Richel Hogenkamp and Arantxa Rus in the singles. 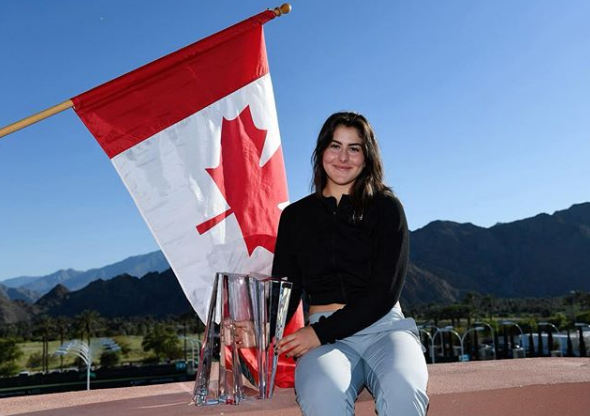 Canada will meet the Czech Republic in the World Group Play-offs in April 2019.
Who is Bianca Andreescu Dating? The Canadian tennis player is reportedly single. She is very young and is 18 years old as of March 2019. Thus, she is focused on her tennis career. No rumors regarding her affairs have surfaced yet. Bianca currently lives in Thornhill, Ontario in Canada. What are Bianca Andreescu's Body Measurements? Bianca Andreescu stands at a height of 1.7 m i.e. 5 feet and 7 inches tall. She has an athletic body build. She has dark brown eyes and her hair color is also dark brown. 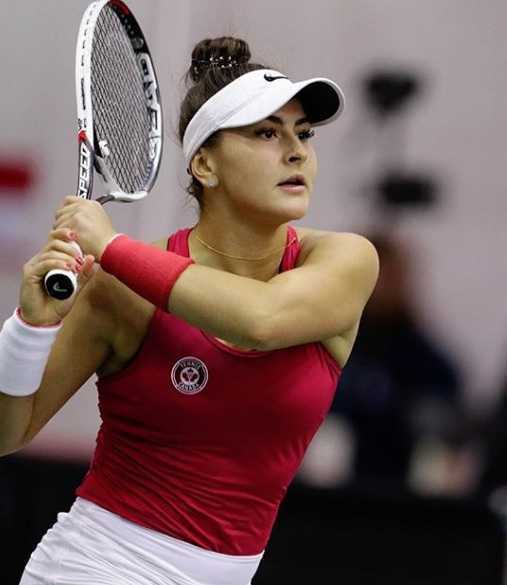 What is Bianca Andreescu's Net Worth? The Canadian aspiring tennis player is very young and emerging talent in tennis. She has gained popularity at a very young age reaching the world ranking of No. 24 as of March 2019. Playing tennis and winning major prize money titles are her main source of income. As of 2019, her net worth is under evaluation. The aspiring tennis player will earn quite a fortune in the future if she continues her glory in the coming years. Her father is an engineer, whereas her mother is a chief compliance of Global Maxfin Investments Inc. in Toronto. Her favorite players are Simona Halep and Kim Clijsters. Her middle name 'Vanessa' was inspired by actress and singer Vanessa Williams.